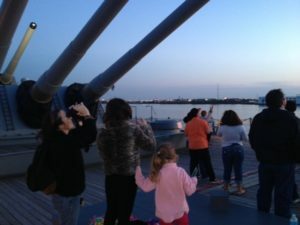 Check out live webcams of the Battleship New Jersey and the Camden Waterfront! NEW JERSEY (BB-62) was decommissioned for the fourth and final time on February 8, 1991 in Long Beach, California and later towed to Bremerton, Washington where she resided until heading home to New Jersey. 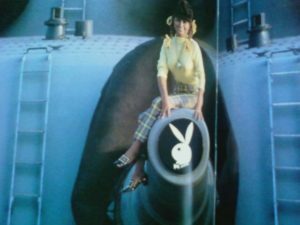 She was officially stricken from the Navy list on February 12,1995 but was then ordered reinstated by an order of congress as a mobilization asset under Bill 1024 section 1011. On January 4, 1999 NEW JERSEY was again stricken from the Navy list and IOWA replaced her as a mobilization asset. On September 12, 1999 NEW JERSEY began her Final Voyage home from Bremerton, where she had rested in mothballs for the last 8 years. 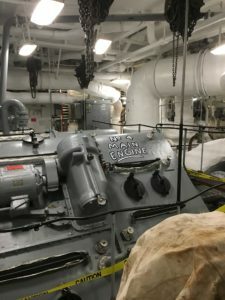 On November 11th, she arrived at the Philadelphia Naval Shipyard. 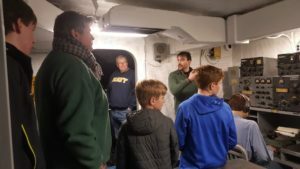 Since that time, she has been restored, opened and established as an educational museum and a tribute to the brave sailors who served on her during her long and distinguished career. 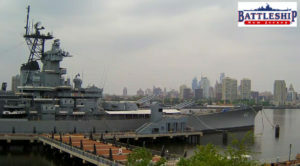 The Battleship New Jersey opened as a Museum and Memorial in October 2001.